President Donald Trump has had not had a stellar few weeks — in fact, to call them lousy would be an understatement. 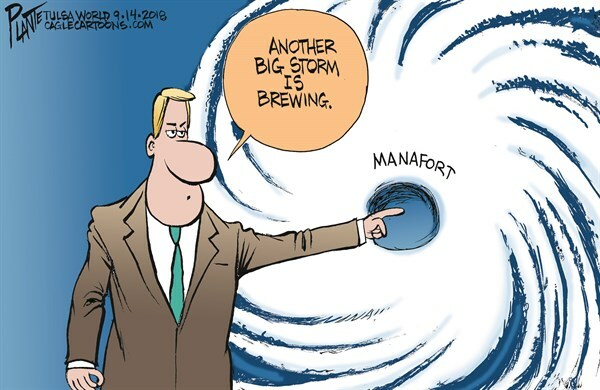 Today, things got a lot worse with what many pundits are calling the “stunning” development that hia former campaign chairman Paul Manafort has “flipped” and will now be cooperating extensively with Special Counsel Robert Mueller. The pivotal questions Mueller’s lawyers want to ask — including about a June 2016 Trump Tower meeting with Russians attended by Manafort along with Donald Trump Jr. and the president’s son-in-law Jared Kushner — have likely already been asked and answered with Manafort’s testimony locked in. On Friday morning, Donald Trump’s former campaign chairman Paul Manafort pled guilty in federal court in Washington, D.C. to two counts of conspiracy relating to his work as an unregistered agent for pro-Russian Ukrainian politicians, among other crimes. Manafort pled guilty not to a straight plea agreement — where both sides give a little, cut their losses, and go their separate ways — but, stunningly, to a cooperation agreement. Paul Manafort’s cooperation agreement with special counsel Robert Mueller is an existential threat to the Trump presidency. Of course, now that he has pled guilty and agreed to be sentenced for all of his criminal conduct, Manafort now has to actually cooperate with Mueller. That means, in essence, that Mueller now owns Manafort. Manafort has to do everything Mueller asks: provide information to investigators upon request, testify in the grand jury, turn over documents to Mueller, and testify at trial. If Manafort is truly on board as a cooperator, then Mueller knows, or soon will know, everything Manafort knows. That must be a scary thought for the president. Indeed, Manafort seems uniquely positioned to deliver extraordinary — perhaps even historic — cooperation. Manafort is situated differently than the other cooperators who have given information to Mueller thus far. Manafort sat in the inner sanctum of Trump world, while prior cooperators like former campaign official Rick Gates and former campaign advisor George Papadopoulos were more like B-listers. Ex-national security advisor Michael Flynn and ex-Trump lawyer Michael Cohen (who according to recent reporting, may be speaking with Mueller as well) both had insider access to Trump. But Manafort looks to have been Trump’s primary conduit to Russia, while Flynn had more limited Russian contacts and Cohen dealt more with Trump’s local and domestic finances. Of all the people in Trump’s orbit, the one who most likely has information about a possible conspiracy with the Russian government — aside from Vladimir Putin himself — is Paul Manafort. Those who practice criminal law — including the three of us — have long predicted that Paul Manafort, the disgraced former Trump campaign chairman, would eventually fold to Robert Mueller, the special counsel. On Friday, we were proven right: Mr. Manafort and the special counsel have reached an extensive cooperation agreement, among the most significant developments in Mr. Mueller’s investigation to date. The capitulation came in spectacular fashion: According to prosecutors, Mr. Manafort has already participated in a so-called proffer session, in which he described information that investigators deemed valuable. Mr. Manafort’s agreement will also require him to give further interviews without the presence of his own counsel, turn over documents and testify in other proceedings. His surrender is complete. We will soon see what it means for the president. Mr. Manafort’s cooperation obviously represents an enormous pivot from the previous strategies he had seemed to be pursuing — trying to persuade a jury to ignore the strong evidence against him based on personal sympathies or, if that failed, to obtain a pardon from President Trump. In our estimation, this about-face represents a realistic judgment on his part, not to mention vindication of Mr. Mueller’s strategy so far. A quick pardon was always a long shot. It would be hard for Mr. Trump to justify politically, even given his willingness to use the pardon power with seeming abandon. A pardon would not protect Mr. Manafort from the wide array of state charges that could be brought against him. Mr. Manafort now has the ability to trade all of the valuable information he has regarding the president and those close to him for a significantly reduced prison sentence. He is the first Trump campaign participant in the now-infamous 2016 Trump Tower meeting to break with the president. Mysteries around that meeting abound. They include whether then-candidate Trump knew about the meeting in advance and why Mr. Trump announced after the meeting had been scheduled that he would soon be giving a major speech on “ the things that have taken place with the Clintons.” Now that Mr. Manafort is cooperating, we may soon have answers. If all that were not bad enough news for Mr. Trump, Mr. Manafort may also be able to shed light on other episodes during his tenure at the helm of the Trump campaign. For Mr. Mueller, the plea deal and cooperation agreement represent momentum: more evidence of his continued success in bringing wrongdoers around the president to justice. It vindicates his strategy of methodically building cases against those in Mr. Trump’s circle and applying pressure on them to cooperate up the chain. For the president, it is ominous. Yet another person who was in Mr. Trump’s immediate orbit has fallen to the rule of law. Now that Mr. Manafort is helping the investigation and may testify in future criminal proceedings — not to mention congressional ones — Mr. Trump cannot be resting easy. But most important, for the American people, today’s outcome is further proof that no one — no matter how important or powerful — is immune from justice. Mr. Trump would do well to study the heights from which his former top aide has fallen, and the depth of his plunge. These developments increase speculation about if and when Trump will attempt to fire Mueller — but also ensure a political firestorm if he does. Which a GOP now worried about holding the Senate let alone the House doesn’t need. Robert Mueller doesn’t play for the blue team or for the red team. He calls the shots as he sees them. Today, Paul Manafort admitted doing everything from money laundering to bank fraud to witness tampering. His guilty plea covers criminal activity spanning 12 years. (2006-2018) When prosecutors described his crimes, the judge said it was the longest re-telling she has ever heard. Anyone recall who hand-picked Pence as Trump’s VP? Paul Manafort. And recall who led the squirrely transition? Mike Pence. Watch what unfolds as Manafort tells Mueller all he knows!